The 34-year-old Wallace, who lives in Toronto, was recently awarded the Toronto IODE Book Award for Chin Chiang and the Dragon's Dance (published by Groundwood last fall), which he both wrote and illustrated. (Wallace won his first prize for illustration at the age of eight, when he was declared the winner of a cover-design contest at the Niagara Falls Public Library.) His 1975 book The Sandwich, which is being revised and reprinted by Kids Can Press this spring, is part of the repertoire of the National Tap Dance Company of Canada. In October, Groundwood will publish a book about an Inuit girl by Jan Andrews that Wallace is illustrating, Very Last First Time. Wallace has prepared the following diary of his week at Fort Nelson. AS FAR BACK as I can recall I have been fascinated by kaleidoscopes  their tumbling, stained-glass colours shifting and changing before my eyes. In sunlight and even moonlight I have delighted in staring down those darkened tubes, recalling the colours and the patterns that I had seen, long after that first initial viewing. Today I can still recall those colours and patterns, and for me kaleidoscopes have become synonymous with memories. These, too, I can recall on desire, reliving the cherished, humorous, and sometimes painful experiences of my life. Here then is my latest kaleidoscope, gathered on my recent trip to Fort Nelson, B.C. 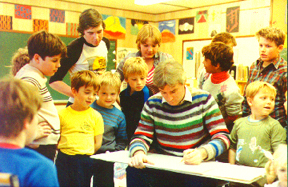 during the Children's Book Festival 1984. 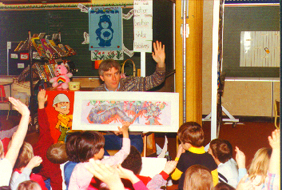 This remote northern village of 4,000 people, situated at Mile 1 of the Alaska Highway, was the winner of the Children's Book Festival's first Win-an-Author-or-Illustrator Contest sponsored by the Secretary of State through the Department of Multiculturalism and administered by the Children's Book Centre in Toronto. In her submission to the contest, Gerri Young, chairperson of the Fort Nelson Public Library and assistant librarian of school libraries, wrote, A visit from an author/illustrator from Toronto, a cultural milieu as different from Fort Nelson as Asia, would enrich our children as a whole. How often have we wondered if they really knew what we were talking about? The children here are not deprived, but they are isolated, and this week could be a festive week and help to draw Fort Nelson's diverse groups closer together.... In a small town where the differences are so readily obvious, it is more constructive to show how we are similar in basic needs and desires.... Each person likes to think that they are special, and I am sure that Mr Wallace could draw them out, and draw for them, and increase their awareness of Canadian cultures. Enormous black birds, "Yukon turkeys", scurrying across the snow-packed ground in their never-ending quest for food. "Any scrap will do," Gerri Young told me as we drove into Fort Nelson from the airport. "Even things that move." Their Herculean size alarmed me, as I imagined one of these birds, a type of raven, clutching a child tightly in its talons and carrying it far off into the frozen muskeg. What would the film The Birds have looked like if Hitchcock had seen these creatures? My imagination soared ominously. Daylight. My official welcome to Fort Nelson comes with the rendition of the soon-to-be-classic tune, The Welcome Ian Wallace Song, sung by the students of G.W. Carlson Elementary School. As that delightful ditty soared about the library, I plucked out the phrase "you're artistic, realistic", reassuring myself that what they really said was in fact "artistic", not "autistic". Now it was my turn on centre stage. I sat tall in my author-illustrator's chair to perform before a succession of classes from kindergarten to Grade 12 over the next five days. With words, actions ("Hey, he doesn't even look at the book! "), and pictures, I brought to life two of my books, The Sandwich and Chin Chiang and the Dragon's Dance. The age range of the audiences would have unnerved even the most seasoned children's author. Actually, my first experience of high-school students was a pleasant one. I found them to be keen and articulate  quite intrigued by the process of writing and illustrating, their questions exhibiting a maturity far beyond their years. "What do you think about violence in children's books? How do you get the water colours to lay on top of one another without turning to mud?" At the end of my first day I was drawing the portrait of one of the students, Kyle, for an enraptured group of classmates, when a teacher burst into the library and pulled me down the hall. "You have to see this," she said animatedly. "Once you have, you'll never forget it. It happens so infrequently in the North." The school door opened into a world turned pink by the setting sun  pink as far as the eye could see. The tall spruce trees laden with pink snow lifted majestically out of their frozen blanket, once white, now pink. The astonishing sight lasted only a few minutes, then disappeared with the fading mid-November sun. On a visit to a Grade 5 class I took the students on my six-year journey to discover the "right" words and "those" pictures that make up my latest picture book, Chin Chiang and the Dragon's Dance. Slowly, systematically, we moved through the rough typewritten drafts that stand five inches high and weigh 12 pounds. We moved through the panoply of thumbnail drawings, character studies, larger roughs, and final roughs, until we reached our journey's end: the finished original drawings and the completed book. All the while, I was conscious that something unique happens in this classroom. A large paper tree growing up from the back of the room spread its branches out across the ceiling above my head. Attached to each branch were countless leaves, each one representing a book that had been read by those students since September. "This is an extraordinary class," I whispered to myself. After my indoctrination to cross-country skiing by some grade 7 students, one of my young teachers reported to his parents, "He skis better than someone from Brazil!" During my trip along the Alaska Highway from Fort Nelson to Toad River, we spotted two caribou, 24 stone sheep, and eight moose  one quite dead, hit by a truck and now lying in the dump just outside the village of Toad River. "Perhaps we could stand it up," said Bob Halmer (he and his wife Barb Halmer were my guides), "and I'll take a picture of you sitting on top." I resisted the temptation. "These dogs run at 19 m.p.h. full tilt, 13 m.p.h. when they're just coasting," said Eddie Streeper, world champion dog sledder with whom I travelled over the muskeg on the back of a sled pulled by a team of 12 dogs. Odd-looking creatures, really, nothing like I had imagined, with long, spindly legs that appeared too fragile to run for up to two hours at a stretch when in training. Sergeant Preston of the Yukon retreated even further to the outer reaches of my mind. A festive dragon, à la Chin Chiang and the Dragon's Dance, made of 30 decorated cardboard boxes strung together with crêpe paper, was brought to life, writhing and kicking, by 30 young students, much to my delight and that of the student body of R.L. Angus Elementary School. (Each student was positioned under the box that he or she had created.) With every step, leap, twist, and curl of the dragon's tail, the students-dancers breathed life into that mythic creature, bestowing prosperity and good fortune on the coming year. "Vincenzo eats stinky meat" became the cry of the day when the students of Pat McKenzie's grade 2 class at R.L. Angus school performed their touching, humorous, and finely acted play, The Sandwich, based on my book by the same name. My paternal instincts overwhelming me, I felt like a proud father being presented his newborn child for the very first time. Friday morning, Chalo School, the Slave Indian Reserve. After a story-telling session, we adjourned outdoors where the 22 students, their two teachers, and I were to toboggan down a steep, slippery hill. Meanwhile, up at the top Adolphus Cabot-Blanc had made a log fire on which we were to cook bannock. Suddenly, I was speeding down that hill, alone, on my flying saucer. Then as I was climbing up the hill for my third flight, a tiny hand slipped into mine. "Mr Wallace, can I walk with you?" asked my new friend Wilma who, like the other native children, had shied away when we first met. "Of course you can. I'd like that very much." "Can I ride down with you, too?" she asked gleefully at the top. "That would be great fun! Let's go!" My trips with Wilma down that treacherous slope lasted only until the other students realized what Wilma had accomplished. And suddenly, I was swamped with kids all wanting to slide with me. (Fortunately, I am tall and there is quite a bit of me to cling to.) All 22 of us sped down the hill, en masse, laughing deliciously as we smashed apart at the bottom. Another gift from the people of Fort Nelson. A pair of finely crafted Slave Indian moccasins, embroidered with beaded flowers and trimmed with beaver fur. "When you hear the call of the North / Listen for the echo / You will hear Fort Nelson," inscribed Fort Nelson native John Kudelke in my gift book, The Fort Nelson Story, written by Gerri Young. My kaleidoscope is complete. Its colours and patterns are firmly etched in my mind, waiting for the next time that I hear the call of the North. The trip was not a one-sided adventure with me arriving as some great educator who comes to the North to impart knowledge. 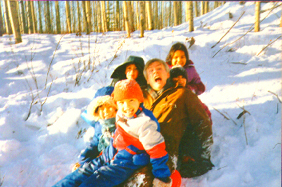 It was a mutually beneficial and satisfying visit during which the people of the Fort Nelson region and I worked, laughed, played, ate, drank, and worshipped together. We learned something about one another, and this experience has given us a deeper understanding of the lives we lead and brought us all closer together.